Your interest in our buoys has not gone unnoticed! Your phone calls, emails, and interactions through Twitter and Facebook, have reassured us that the buoys are valued and needed. 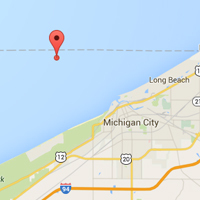 We are very proud to be able to offer the services of two buoys — one located in the waters north of Michigan City, Indiana and the other near Wilmette Harbor, Illinois. Our goal is to provide real-time data for a variety of uses — charter fishing, recreational boating, weather forecasting — to name a few. By providing any amount — big or small — we can keep the buoys in working order and get them safely deployed and provide data in the same timely manner that you have come to rely on. DONATE BY CHECK – please mail to Lisa Merrifield, Illinois-Indiana Sea Grant, 374 National Soybean Research Center, 1101 W Peabody Dr, Urbana, IL 61801. Include your mailing address for a tax-deductible receipt. If you are interested making a large donation or exploring a possible partnership, please contact us at 765-496-3722 or email amcbride@purdue.edu. We would love to hear from you! Wave Period(dominant): seconds – dominant wave period is the time between dominant (highest) crests. Displayed wave period is the biggest record in a 10-minute window. Solar Radiation: watts per square meter (W/m2) – the measurement of the sunlight coming through the atmosphere. The buoy is located in about 62’ of water. Attached to a ton-weight concrete anchor, the 500-lb buoy can be seen with 7’ above the surface and 8’ below. 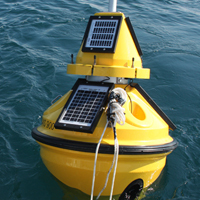 The buoy is outfitted with a flashing beacon light as required by law.